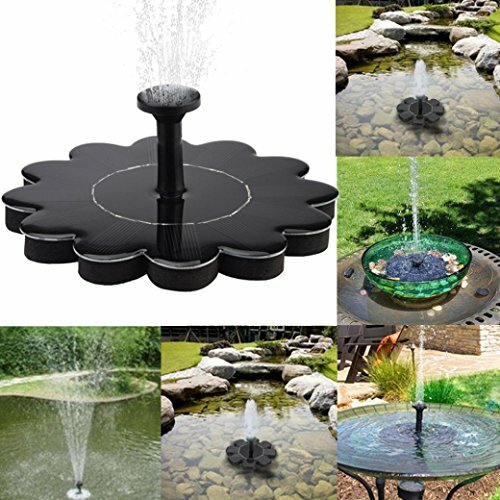 Buolo Outdoor Solar Bird Bath Water Fountain Pump Solar Panel Water Floating For Pool, Small Pond,Garden, Aquarium | Fountain City Art Ctr. 1: Exclusive sunflower design with good implications, solar fountain inspired by Van Gogh's sunflower paintings. Solar panel 12 petal symbolizes: hope, glory, freedom, unity, faith, talent, happiness, friendship, love, health, youth, wealth. 2: Premium monocrystal silicon solar panel works on 1.2w would show strong performance in weak light environment than 1.4w solar panel . Cause the smaller the watts are , the less sunlight is needed . 3: The fountain pump is driven directly by the sunlight. Start automatically in 3 secs when sunlight shines on the solar panel. It will work continuously when the sunlight is enough. 4: Removable and cleanable water pump, super quite submersible water pump which is strong fastness to solar panel,disassemble and easy for cleaning. [ECO-FRIENDLY]: Solar powered. NO built-in battery to store power. Only work under direct/sufficient sunlight in the daytime. Please place your fountain in an area that can get good sun exposure with no shades or shadows.It starts automatically and fast after 3 seconds in bright sunlight and delivers a nice tall, continuous and steady flow of water. [EASY INSTALLATION&MAINTENANCE]: No extra screws and no plugs is needed.No electric outlet or battery is needed. It needs a little maintenance regularly, but it is very simple to disassembled the unit and clean the debris off the pump intake filter. [4 Nozzles]: 4 replacement nozzles allow you to choose fountain water patterns at will. [MULTIPE APPLICATION]: Cool. It is a must buy to decorate your garden,patio,yard,backyard,fish tank,small pond, pool,etc. It is also ideal for oxygen aeration and water circulation to keep the mosquitoes/insects from breeding.